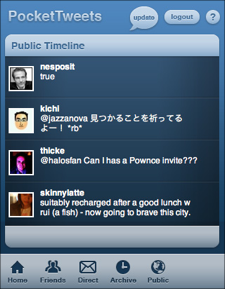 PocketTweets is a web based Twitter client for the Apple iPhone. It allow you see the latest tweets from your contacts, update your status remotely, or see what's happening around the world by viewing the public timeline. -- all via EDGE or WiFi. To access PocketTweets go to the url www.pockettweets.com in your iPhone Safari browser.